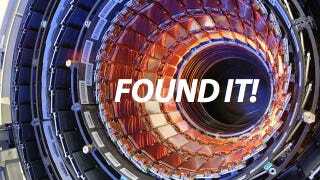 In July, scientists announced that they'd discovered what they strongly suspected to be the Higgs Boson, a particle that's believed to be the key to unifying the standard and quantum models of physics. In August more experiments made the finding more certain—and now, the results have been peer-reviewed and published, making them, for want of a better term, real science. Published as two academic papers in Physics Letters B, the results don't make light reading. But they are important. While nobody every doubted the work of the CERN scientists, the results being vetted by peers and then published in an established journal act as a kind of rubber stamp. The results, as far as the scientific community are concerned, are accurate; the science is reasonable. The discovery, in other words, is valid. As we've reported before, the scientists have to demonstrate a high level of certainty in their results for the work to be published. The initial results from July pinned a 5-sigma level of certainty to the finding: in other words, that there was a one-in-3.5 million chance that the finding was a fluke. Now, the researchers are confident that there's less than a one-in-300 million chance that the Higgs does not exist.